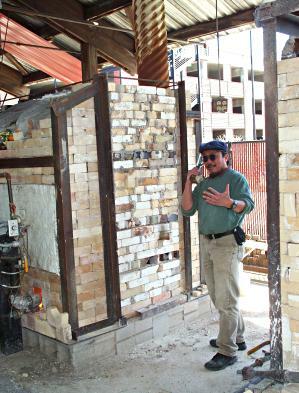 Here is a picture (figure 2) of the new soda kiln at Pottery Northwest — okay, it doesn’t look new, because the bricks used to brick up the door are old and ratty looking; but, as you can see, the bricks to the left of the door and on the burner side are all new and clean. Anyway, it’s a cross-draft kiln, with 2 forced air burners (you can see one of them in the photo above) on the left, and the chimney on the right. Note all cross-draft kilns are also down-draft kilns by definition. For a variety of technical reasons, the temperature of the kiln must be brought up very slowly in the beginning of the firing. We typically spend the morning slowly turning up the gas, e.g. up just a notch every half hour or so. In the early stages the kiln is cool enough to touch — and we sometime use our hands to feel all around the kiln (figure 3) and see if it is warming up evenly. The process of firing the soda kiln is pretty much the same as firing a regular gas kiln, except for the last step of putting the soda in. 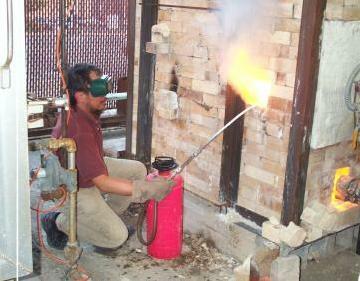 There are different ways of adding soda, but for our soda class at Pottery Northwest we usually — but not always — spray (figure 4) a soda carbonate solution into the kiln at about cone 6. If you want to know more about soda firing, Emily Murphy has a good write-up on the history and process of soda firing, and the Gail Nichols article in Ceramics Monthly is a must-read as well. 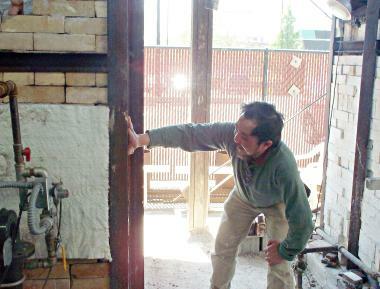 You may also want to check out the group blog by the Summer 2006 Independent Study Group at Pottery Northwest –which includes this video of their soda spraying process that I have contributed. 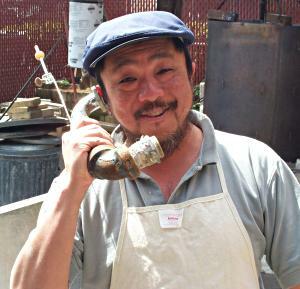 This entry was posted on Sunday, August 20th, 2006 at 9:39 pm and is filed under About Me, Soda Fired Pottery. You can follow any responses to this entry through the RSS 2.0 feed. Responses are currently closed, but you can trackback from your own site.